Well, gang, you did much better with these questions! 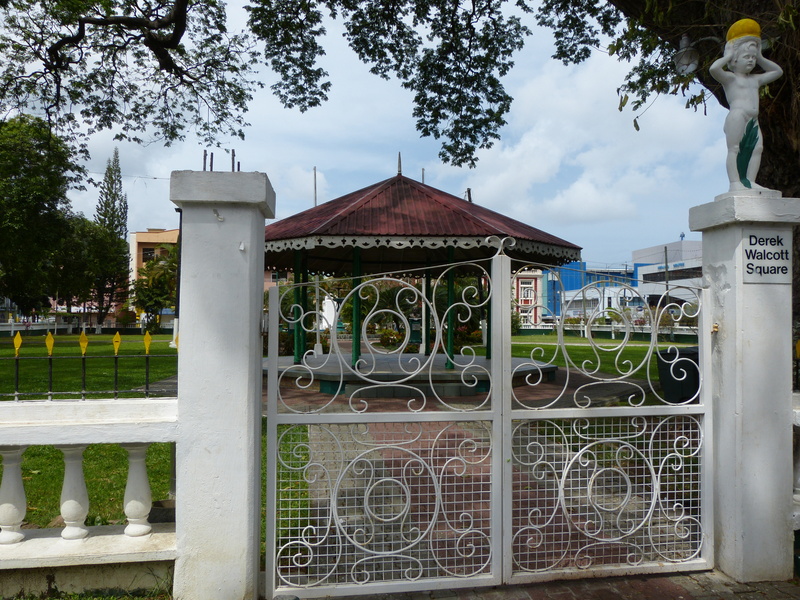 The correct answer is Castries (also the answer to question 9), But the names of the ports works too. 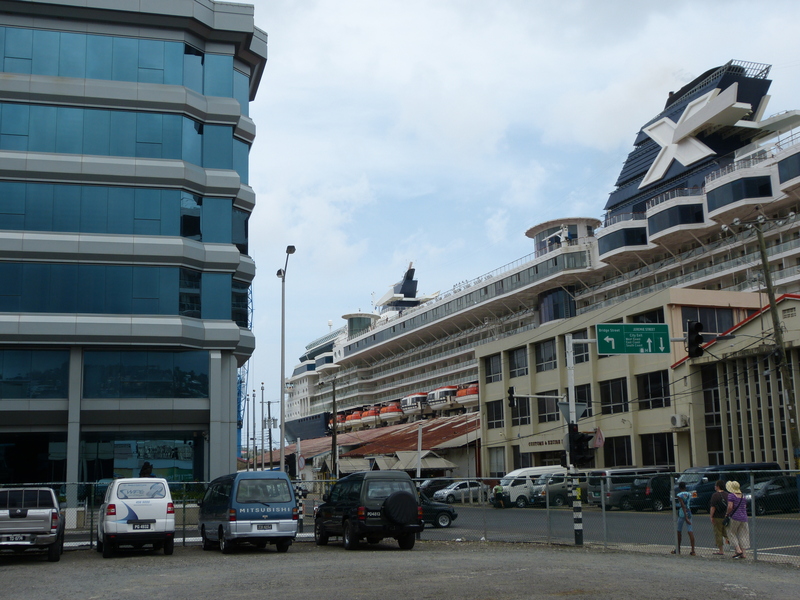 The Celebrity ship is bigger than the office building across the street. Yikes! 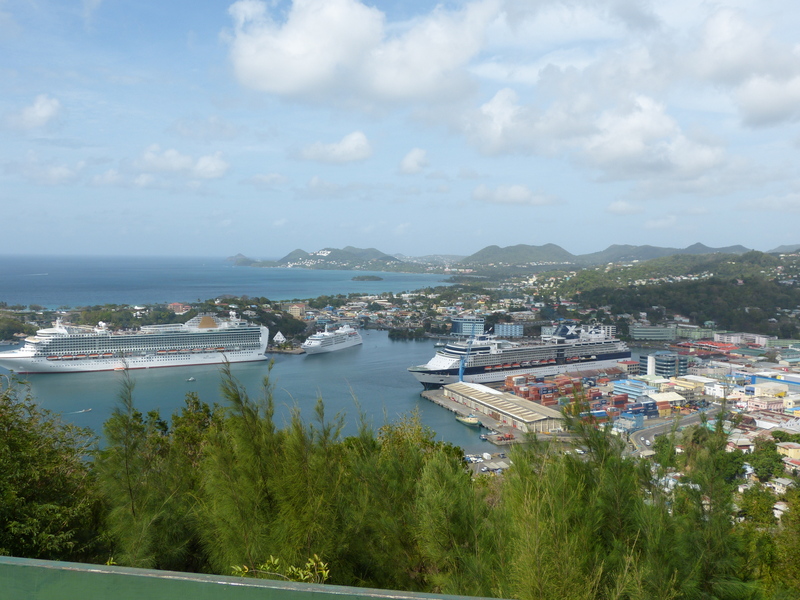 Here’s a view of the port from one of the scenic overlooks we visited with Jeffrey and Ashley on our Sunday off. That Celebrity ship is on the right in the photo below. if you look carefully, you can make out the office building. See what I mean? Sorry for the blurry photos. I was using my iPhone for these. Didn’t want to be weighed down with my regular camera. 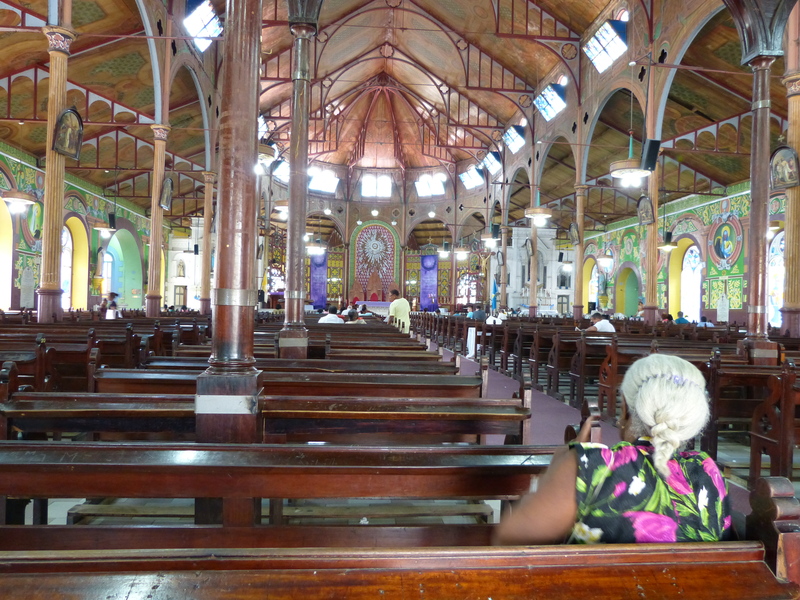 Question 5: Which two countries spent 150 years fighting over St. Lucia? Yes, the French and the British were duking it out and yes, the last country standing was Great Britain. Hail Britannia! 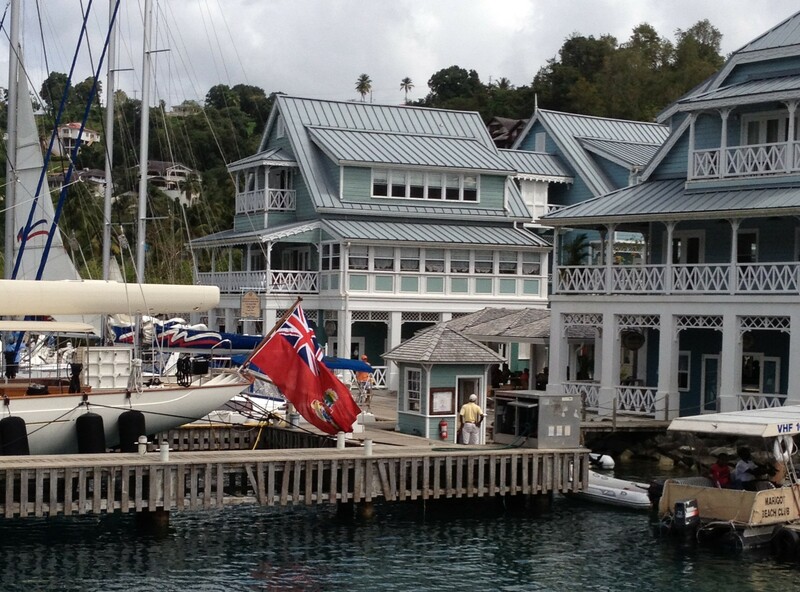 Notice the flag on the sailboat in Marigot Bay, the nearest town–the one with the bank that wouldn’t accept my ATM or credit card. Yep, It was 1979. Sorry, no visuals for that question–other than the mental picture that Lissy provided. Sorry ladies, but spelling DOES count, so Lindy and Sue get extra credit for getting it right. Kristy gets a point for creativity and for making me laugh. 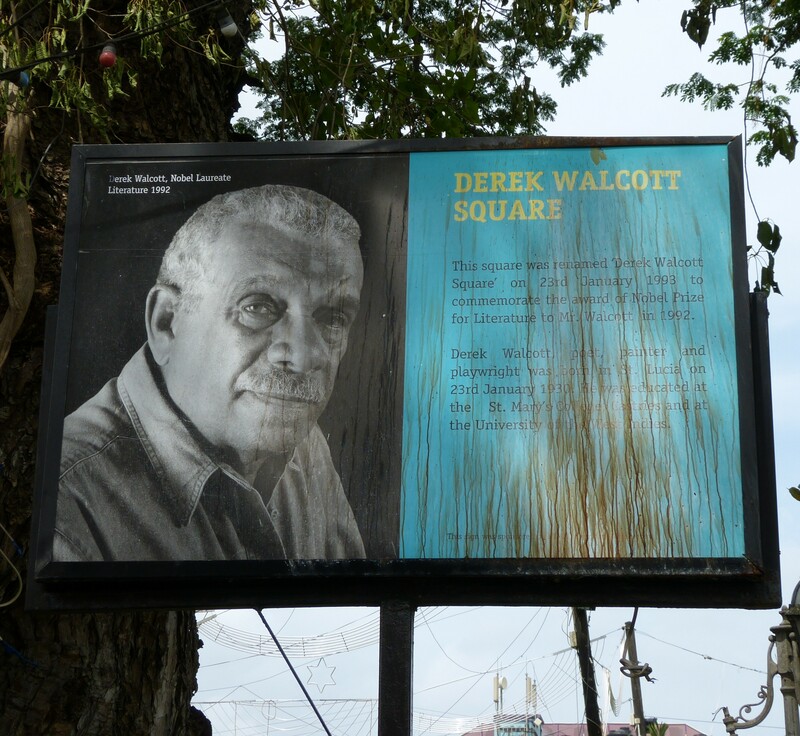 The Square named for Derek Walcott is right across the street from the Basilica. I wonder if that is why the cherub (facing the Basilica) has a leaf growing in a strategic place? The Basilica is quite beautiful. I was fascinated by the ceiling! I also stopped in at the Pentecostal service down the street. The service took place in a small auditorium, with a stage, and white plastic chairs. The congregation was standing, swaying and singing–and were most kind and welcoming. I stayed to sing one song with them, but had to get back to my traveling buddies. But I digress. Back to the contest. Yes indeed–it IS banana ketchup. So, the score to date is: Lindy 8 points, Lis and Sue tied with 7 points, Sandy 5, Kristy 3, Jim 0 – and Mike has already received his prize, so he is out of the competition. One more set of questions–this one will be about Global Volunteers–and then the contest closes. Prizes to be awarded the first weekend in May. I am trying to answer the final question but I am unable to post it on the email sent to me. I have read all the questions and I think they are all true. I will keep trying to put them in on the right page.